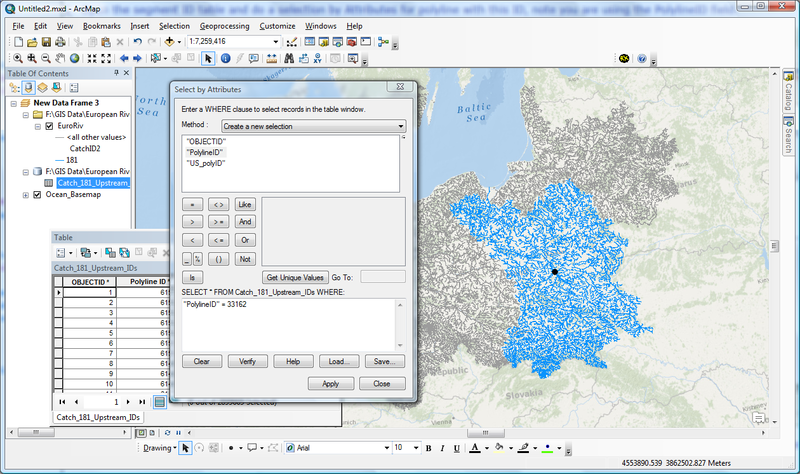 •If you have generated segment ID tables with RivEX you can then relate these tables for powerful spatial analysis using standard ArcMap functionality. This page describes how to set up a relate with an existing segment ID table. 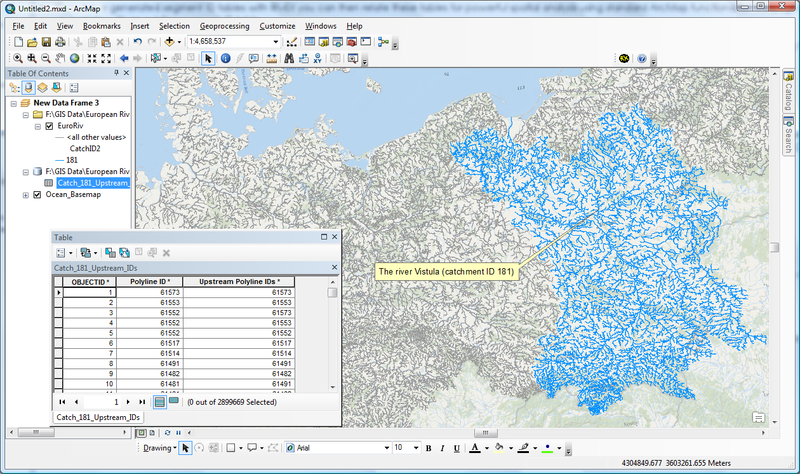 •Below is a screen shot of the River Vistula, the catchment ID tool attributed it with the ID number 181. This dataset was run through the segment identifier tool using the FID column as the polyline ID field. 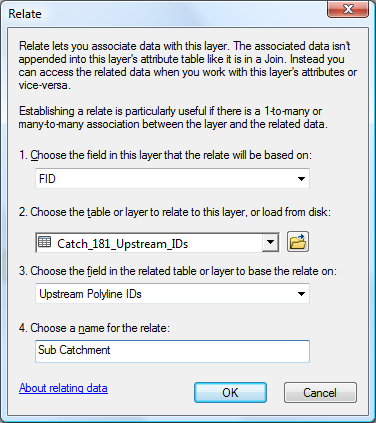 The segment table for catchment 181 has been added to the project. •Complete the Relate dialog as shown below. For (1) you must choose the polyline ID column you used when you built the segment ID tables, choosing another will break the relationship. Choose the segment ID table for (2) and use US_polyID for (3), do not use the field PolylineID. You can give your relationship a name, in this example it is called Sub Catchment. •Now identify any polyline in your network. In this example the polyline marked with a black dot has an FID of 33162. •Open the segment ID table and do a selection by Attributes for polyline with this ID, note you are using the PolylineID field. •Close the select by Attributes dialog and on the segment ID table go to Options > Related Tables > Sub Catchment : River Layer. Close any tables that open and you can see your sub-catchment selection. •Hopefully you can appreciate how useful this technique is for sub setting your data. Such a selection could be used in selecting other features, reporting statistics encoded into your network (e.g. water quality) or simply exported to a new dataset.